I am not able to use the mouse that came with the Turret for Xbox One to navigate through the Xbox One menu. Xbox supports the use of mouse and keyboard in some games and apps, but it doesn't work for every game or app. The game or app publisher must enable this feature for their content. Xbox One doesn't support mouse input on Home or within Xbox user interface and Settings. A mouse will also not work in Edge, which already has an on-screen cursor. A controller is needed to configure the mouse. 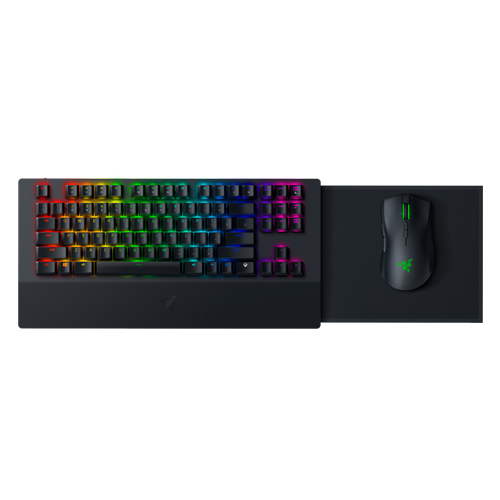 What type of Razer switches does the Razer Turret for Xbox One keyboard use? The Razer Turret for Xbox One uses Razer Green Mechanical Switches. What is the capacity and what type of battery is used in the Turret Keyboard and Mouse for Xbox One? Are the lighting effects on the Razer Turret for Xbox One keyboard and mouse customizable? *These effects are only available for the keyboard. Where can I download the Razer Turret for Xbox app? The Razer Turret for Xbox app is available in the Microsoft Store. How do I charge the Razer Turret for Xbox One's mouse and keyboard? Connect the mouse to the keyboard mouse port using the included keyboard-to-mouse charging cable. Connect the power adapter to the keyboard using the included USB-A to USB-C cable and plug it into a power outlet. The power indicator will light up red to indicate that the keyboard is charging. The mouse will also begin to charge. When the keyboard is fully charged, the indicator will light up green. For best results, please fully charge your Razer Turret for Xbox One before using it for the first time. Will the Razer Turret for Xbox One's keyboard and mouse be able to charge if I connect the USB-A to USB-C cable to a USB port on the PC or Xbox instead of the power adapter? Yes, but it will charge significantly slower. Where can I find the wireless dongle for the Razer Turret for Xbox One keyboard and mouse? How do I connect the Razer Turret for Xbox One's Keyboard and Mouse to my Xbox One or PC in wireless mode? Remove the USB wireless dongle cover and pull out the USB wireless dongle from the mouse. Connect the USB wireless dongle to the USB port of your Xbox One or PC. Switch on the keyboard and mouse. How do I connect the Razer Turret Xbox's Keyboard and Mouse to my Xbox One or PC in wired mode? Connect the keyboard's USB-C port to your Xbox One or PC using the included USB-A to USB-C cable, then turn on the device. Connect the mouse to the PC using the included USB-A to Micro-USB cable, then turn on the device. What do the different power indicator colors and patterns mean on the keyboard of the Razer Turret for Xbox One? The power indicator on the keyboard displays the keyboard's battery status. Please refer to the chart below for further details. How do I know if the Razer Turret for Xbox One's mouse is low on power? The Razer Turret for Xbox mouse’s scroll wheel will blink red twice in repeated intervals to indicate that the battery’s power is less than 5%. This lighting sequence will repeat until the battery is drained or the mouse is connected to the PC via the USB-A to Micro-USB cable. 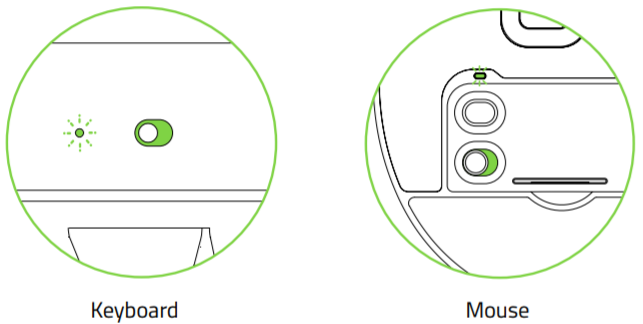 How do I access the retractable mouse mat on the Razer Turret for Xbox One's keyboard? Turn the keyboard over to locate the latch. Hold down the latch on the right side of the keyboard to unlock and pull out the mouse mat. How many profiles can the Razer Turret for Xbox mouse store in the on-board memory? The Razer Turret for Xbox mouse can store up to 5 profiles that you have programmed in Razer Synapse 3, which you can then use on systems that do not have Razer Synapse 3 installed. Will the Razer Turret for Xbox keyboard and mouse work on my Android TV? The Razer Turret for Xbox One is designed for Xbox One and PC use only. What are the specs of the Razer Turret for Xbox One's Mouse? What are the specs of the Razer Turret for Xbox One's Keyboard? What comes in the box of the Razer Turret for Xbox One? What are the System Requirements for the Razer Turret for Xbox One? Comparison chart for Razer Turret and Turret for Xbox one. Can I use the Razer Turret for Xbox One with my PC or Mac? The Razer Turret for Xbox One is compatible with Windows PCs running Windows 7 64-bit or later. It is not compatible with a Mac.